The Clarets' wonderful unbeaten run on the road was brought to an end as title-chasing Manchester City won 3-0 at the Etihad Stadium. Burnley had secured eight points on their travels having taken in trips to Stamford Bridge, Wembley, Anfield and Goodison Park, adding victory against Rovers in the Carabao Cup, but they found the table toppers just too good on this occasion. Boss Sean Dyche slammed the theatrics of Huddersfield Town's Rajiv van La Parre when the midfielder attempted to con Chris Kavanagh in to awarding a penalty at Turf Moor last month. The referee, however, was unconvinced by the substitute's animated fall and rightly booked the Dutchman for simulation. Dyche, then, would be even more scathing of Bernardo Silva's involvement in City's opener at the Etihad Stadium as Roger East fell for the Brazilian's over-exaggerated acting. The Portuguese playmaker, signed from Monaco for £43m, knew exactly what he was doing when going down under the challenge of Nick Pope on the half hour mark and rolled around in a ridiculous manner to ensure that the decision was awarded in his favour. The 23-year-old will likely escape any retrospective punishment from the FA for his influential antics as there was minimal contact and to make matters worse Sergio Aguero consequently opened the scoring from the spot. 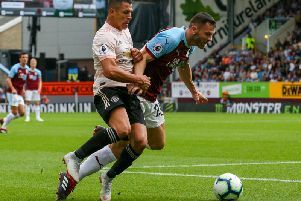 It was a huge blow for the Clarets who had started admirably against the Premier League leaders, who had scored 17 goals in their previous three league matches when holding home advantage. In fact, Pope's only involvement in the first quarter-of-an-hour of the fixture was to make a routine save from Kevin De Bruyne's attempt from the edge of the box. The visitors were unfortunate not to get a break in that same period when Chris Wood got away from Kyle Walker and Nicolas Otamendi to claim ownership of Jack Cork's clearance but the ball escaped the striker's control and Ederson smothered. That would be the record signing's final involvement against the Citizens as he later limped off and was replaced by Ashley Barnes. Burnley, as ever, were brilliantly organised and disciplined but City were still able to engineer tunnels beyond that backline, something that many others have failed to do before them. City went close when Leroy Sane hit the bye-line from David Silva's incisive pass and squared the ball in to the penalty area where Bernardo Silva's strike was beaten away by Pope. Silva, who has a nack of doing the simple things incredibly effectively, then supplied the slide rule pass to free De Bruyne but the Belgium international was thwarted by Pope. But, from the follow up, as Pope tried to throw water over the fire, the goalkeeper provided Silva with an excuse to go down. East will no doubt be quizzed by Dyche in the aftermath but the match official's dubious decision stood and the hosts finally found a way through. Sergio Aguero, who returned to Pep Guardiola's XI following a road accident in Amsterdam, sent Pope the wrong way from the penalty spot and equalled Eric Brook's club record of 177 goals, which was set in 1938. Aguero had chances to extend City's lead later in the half but the Argentinian was frustrated by Pope who was in inspired form. After firing wide of the far post, the striker was then denied by the former Charlton Athletic goalkeeper's legs at the near post. And in first half stoppage time, Aguero found space inside the penalty area to get a shot away but, with the ball threatening to find the far corner, he was denied by Pope's out-stretched leg before James Tarkowski made a brilliant block to keep Silva's follow up out. The Clarets refused to sit back and roll over after the break but that ultimately played in to City's hands as they went on to extend their advantage. Silva skewed a left-footed strike wide of the upright from 25 yards out after leading the charge and the Spaniard went close again latching on to a loose ball and forcing Pope in to a reflex save at his near post. However, from Sane's resulting corner, Otamendi towered above Ben Mee to head in to the corner and double City's lead. The majority of fans within the stadium, along with Guardiola, could breathe a huge sigh of relief but two minutes later, in the 75th minute, they were able to celebrate. Aguero's improvised flick presented De Bruyne with space in the middle of the park, the in-form midfielder picked out Sane and the German international kept his cool to thread the ball in to the corner. City could have added a fourth when Sane allowed Kyle Walker's cross to run through to Silva who, with the goal at his mercy, failed to control before substitute Gabriel Jesus picked up the pieces and struck the ball at Pope. Sane should have scored his second of the game deep in to time added on but, with only Pope to beat, the winger's effort was off-target.